Earlier this year, I took my parents and nephew to see Risen, which had a preview for God’s Not Dead 2. I hadn’t yet seen God’s Not Dead, but being a history/political-science buff, and having gone to school to become a teacher (although that still hasn’t happened,) I was intrigued. 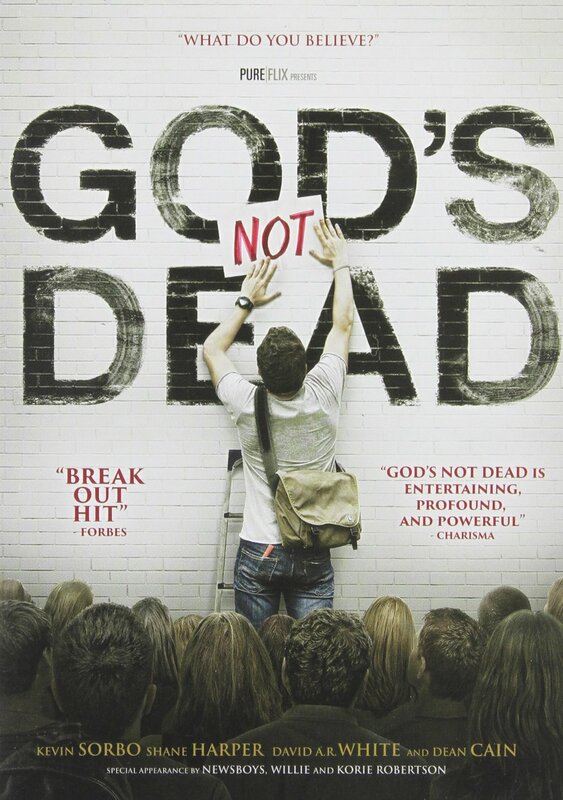 I found God’s Not Dead and have to say, while hard to watch as a Christian, this is something that truly is happening on college campuses today, and I’m glad I did. Well, today, I took the parents and nephew to see God’s Not Dead 2, and we’re definitely going to see number 3 if/when it’s released. Now, without spoiling the movie (and this is just from the trailer,) God’s Not Dead 2 follows a court case wherein a High School teacher is being sued by the parents of one of her students for “preaching in the classroom.” From the trailer we know that a student asked a question comparing Ghandi and the Reverend Dr. Martin Luther King Jr. to Jesus in their stand on non-violence. She asked about his words “love your enemy.” Melissa Joan Hart’s character then quoted that scripture, that’s it. During that scene in the trailer, another student texts his parents about it, and the teacher then starts a wild ride. Now, I won’t say more about the movie, so as not to spoil it, and I ask that you not include spoilers in any comments. Moving on though, this isn’t a made up issue, nor an isolated one today. The production studio has listed many cases where Christians are silenced, or the attempt is made, on their website. I have a PDF of it here for anyone who doesn’t have Word or another program which opens Word files. This document shows instances of teachers and students being targeted, from elementary to post-secondary school, and thankfully, ADF represents many of these individuals, and has successfully kept the right to have your own faith and not hide it. I’m a history major, and love the study of history and politics, so I know the words of the U.S. Constitution, Bill of Rights, Declaration of Independence, and much more. The First Amendment states “Congress shall make no law respecting an establishment of religion, or prohibiting the free exercise thereof…..” Yes, it goes on to list freedom of speech, the press and assembly, but the establishment and free exercise clauses are at the heart of these cases. The ACLU loves using the Establishment clause, and ignoring the free exercise clause, and does so often. Of course, “Separation of Church and State” is flung around as if chiseled into the very stone of all government buildings, while it’s ignored that Thomas Jefferson used that phrase in a letter to the Danbury Baptists, and meaning that the separation is to protect the Church from the State, not to silence believers. Being saved by grace means you can never earn it. Not only can you never live a completely sin free life, but neither can you volunteer, donate, or do enough to gain entry into Heaven when you die. This, it seems, is now the crux of the matter. The people who attack Christianity want to force Christians to recant, and to tell the world that avoiding hell (if they even acknowledge the existence of Heaven and hell) is a “right” and to be told you must work at it, you must repent, and you must accept Christ as your savior, is “denying their rights” so that they can then try to sue to force people to, at the very least, be silent. So, to wrap this up, an old quote from Voltaire “To learn who rules over you, simply find out who you are not allowed to criticize.” Now, I use this more often than not when referring to politics, but it works just as well in this situation as well. Today, criticizing the LGBT community, any minority group, or any faith other than Christianity, seems to be a lightning rod for the ACLU to sue. Why are we not allowed to speak about our faith, or criticize those who want to silence us? The answer is simple, those attacking Christianity in any way, want the benefits without the work. They want to go to Heaven, but want to live however they want until then. This is seen also in those who don’t want to work, but want a new car/TV/phone/etc. When you even suggest they work for the money to pay for those things, they scream that you’re “denying a right.” When anyone suggests drug tests for welfare recipients, or a “welfare to work” program, you’re “forcing single mothers to abandon their kids to strangers” never mind that women are having kids just to get more money, and these kids grow up to be criminals due to parents who don’t care about them. We must stand up and take our country back, or we will lose it forever. You will never see me advocating a Theocracy, nor should you. The Founding Fathers set up a government where the people held the power, but it’s slowly been taken from us. I dream of a small government in DC, and at the state and local level. A government that only collects tax that it needed, no more, and doesn’t invent needs. I dream of the day when the government stops ordering how subjects be taught, how businesses operate, and how we live our lives. Yes, some will cite “discrimination” by businesses that refuse to serve gay customers, and it’s happened, but oddly, even when they are driven out of business by a small group of people, others rally to their aid. Why not let the market decide? If you don’t like a business, don’t spend your money there. If enough people do that, the business changes, or goes out of business. Christians are still doing that, we go to Hobby Lobby and Chic Fil A to support Christian/Faith Based businesses, and when a Christian is turned away by a business owned by someone who is part of the LGBT community, you don’t see a lawsuit, you just see them not go there at all, and word of mouth to their friends and family, no rants or cries for the “horrible discriminatory business to be destroyed,” just capitalism at work. Odd isn’t it, that the very people who scream about discrimination, hate, intolerance and so on, are themselves the most guilty of it. While those they accuse, well, we may be upset and we may speak up, but we seem to be the ones, most often, who are the most inclusive and tolerant. Jesus taught that we are to love those who hate us, that we are to feed the hungry, house the homeless, and clothe the naked. To me, that’s it, I don’t care who you are, if you’re hungry I’ll feed you, and I’ll do all I can to help you back onto your own two feet. Why is it then, that I’m still a bigot or worse, simply because I happen to be a Christian? Movie Website – PDF of cases obtained here. I also tweeted MJH, Ray Wise and Lee Strobel, who knows, maybe they will get to Ft Worth for coffee/tea and a chance to chat. I might need to be woken up, or need O2, but still, who knows. Next Next post: Would you rather be needed, or wanted?